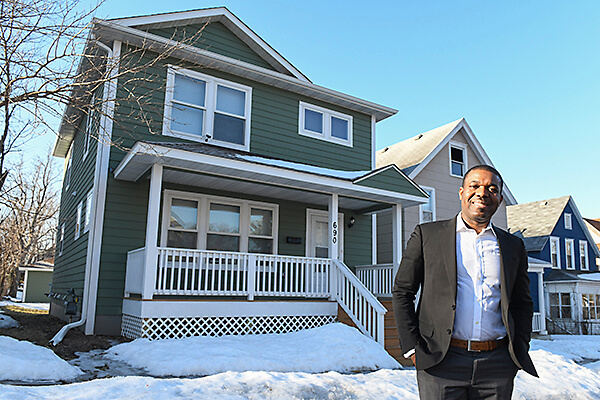 This newly built four-bedroom, two-bath home from Twin Cities Habitat for Humanity has 1,632 square feet of living space plus unfinished basement for future expansion. Detached 2-car garage. The house received a HERS score of 48, which makes it very energy efficient, depending on owner’s usage. It incorporates durable materials to help with maintenance. Habitat builds, renovates and sells homes to homebuyers at 30-80% AMI (Area Median Income) www.buywithhabitat.org for more information. Visit both of our homes on the tour to learn more about acquiring a home, or donating, volunteering, supporting affordable housing and making an impact.